The Wyoming ranch claims three classes at the AQHA Ranching Heritage Challenge in Billings, Montana. Matt Koch and Hesa Hickory Cat turn a cow on the fence during the AQHA Ranching Heritage Challenge. The final Ranching Heritage Challenge of 2014 was held October 17 in Billings, Montana, and Wagonhound Land & Livestock dominated. The ranch based in Douglas, Wyoming, won three divisions of the Working Ranch Horse class: the Open 4-Year-Old, the Open 5-6-Year-Old, and the Cowboy. The Ranching Heritage Challenge is an American Quarter Horse Association event designed for working cattle ranches that raise Quarter Horses. AQHA offered six competitions this year throughout the country. The Billings event, held during the Northern International Livestock Exposition, featured 60 entries, making it the largest Ranching Heritage Challenge of 2014. Wagonhound cowboy Matt Koch rode Hesa Hickory Cat to win the Open 4-Year-Old Working Ranch Horse class and a check for $1,940. Koch also won the Open 5-6-Year-Old class and $1,260 on This Cats King. 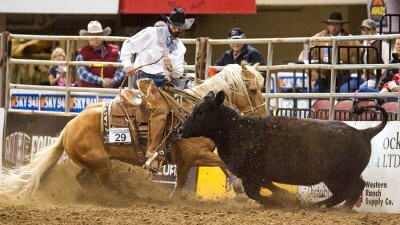 Chance Waite claimed the title in the Cowboy class aboard This Kissin Cat. All three horses were sired by Wagonhound stallion WR This Cats Smart. AQHA Ranching Heritage Challenge events are sponsored by Zoetis, which adds $10,000 to each of the six events. Local breeders contribute an additional $5,000 or more. The event is open to any horse bred and raised by an AQHA Ranching Heritage Breeder. The events feature working ranch horse, boxing and ranch pleasure classes and include open, limited open, amateur, novice amateur and cowboy divisions.